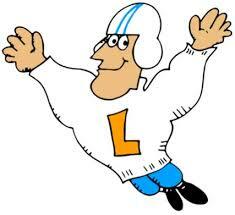 Before David Letterman, there was THE Letterman. My own history with varsity style involves a lot of very un-varsity moments. I would eventually experience great disappointment in discovering that the only part of this movie that applied to my freshman year at college was the nerdiness. First, when I was a little kid, there was varsity-superhero Letter Man, a favorite regular on the PBS show, Electric Company. His sport: ripping the letter from his sweater and applying it to spoiled words – thus restoring “custard” to those who’d been forced to eat mustard. Kids learned to read. The word/world was saved. 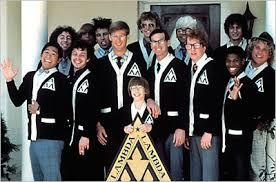 Then there was “Lambda Lambda Lambda,” the fraternity in which a gaggle of outsiders found comradery, legitimacy and pride in Revenge of the Nerds. Moving on, there was my big opportunity to earn a letter in high school. No, not in football. In the National Speech and Debate Organization. I would go on to win second place in state, but stupidly, I turned down the letter. That move would go on to haunt me for decades. The unfortunate mistake I made had nothing to do with the prestige of lettering, seeing as how my award-winning speech about drawing Beatles caricatures afforded me all the prestige I needed. Rather, I lost the opportunity to bag one of those cool sweaters. The usage infographic on the right testifies to the return of the term “varsity,” in modern parlance. This is especially fortuitous because it coincides with the availability of varsity apparel for style-dorks. The monopoly on this classic piece of Americana, previously held by the sinister jocks (Alpha Betas and their cronies), has been broken. 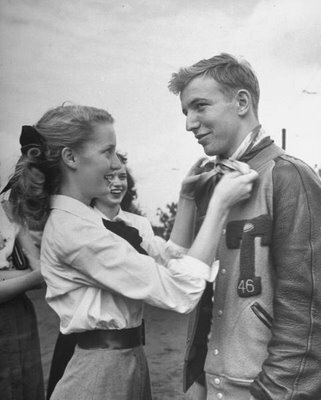 Before I tell you where to nab a great varsity sweater and what to wear it with, a little history. First, the word varsity is derived from the word “university,” and simply reflects an outdated pronunciation. The tradition of the letter goes back to the second half of the 1800s, when Harvard used them to mark uniforms, and would award the lettered jersey to the captain of a successful team at the end of the season. Ten years before this, a successful British military commander during the Crimean war made popular a button-up woven garment. His name? James Brudenell, 7th Earl of Cardigan. These historical events, combined with the roaring twenties and the rise of college culture, lead to the proliferation of the varsity sweater across America, and that leads us to today, where I have a few to many of them in my closet, and yet, weirdly, not enough. 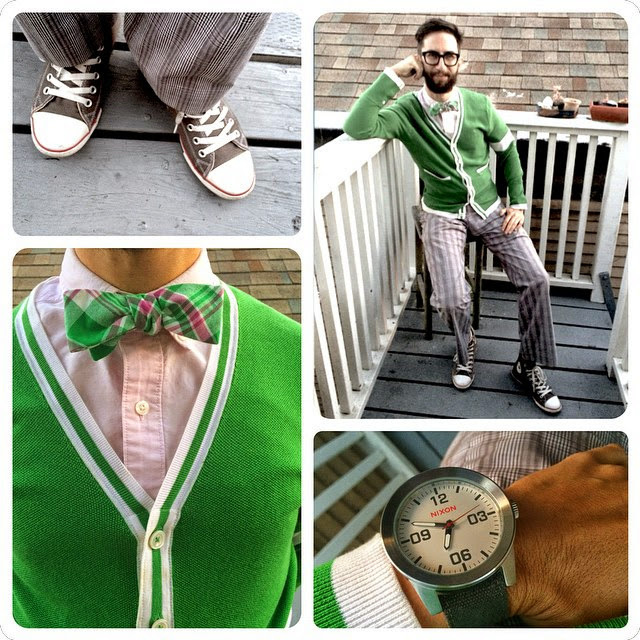 While you could wear a varsity sweater as a layer piece over whatever you wanted, I’d like to suggest that the fun multiplies with additional vintage style elements – many of which are as common as a pair of dark, indigo jeans, with a generous cuff, and even a bow-tie or newsboy cap. On the other hand, if you’re concerned about looking too costumey, have a peek at my How Much Flair infographic, which will guide you in upping your style-game without going overboard. 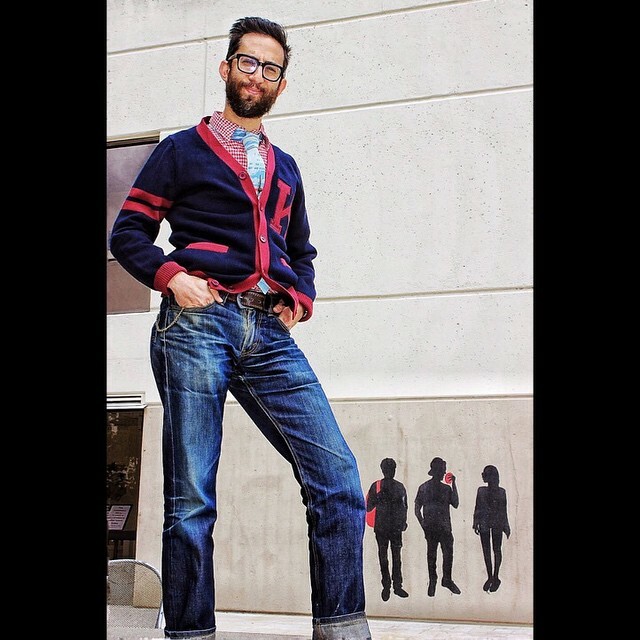 This look (above) pairs a great varsity sweater by the progressive clothing company Kipper Clothiers with a denim tie and a gingham shirt: Americana layered on Americana. This sweater is beautifully made, soft, and stylish. Grab a pair of incredibly cheap, but incredibly styley PF Flyers to complete the look. Note: if you want to layer this many patterns, stick to a tried-and-true color palette: red, white and blue. This sweater lacks the typical letter of a varsity cardigan but hey, notice the stripe on the sleeve? That’s Thom Browne’s nod to the varsity stripes – which, incidentally, stand for how many years you participated in the sport. In this case, the sport of styliness. 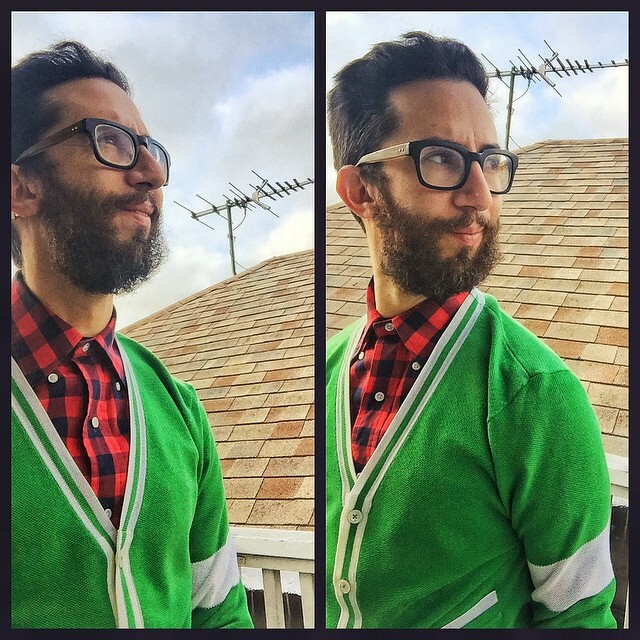 On the left, the sweater is paired with a gingham shirt, an idea I shamelessly ripped off from StayFlyThrash, who pulls off advanced style swerves that require a PhD in cool. Somehow, the strong colors work, and pull the look off the college campus and push it into post-modern fashion-zone. On the right, paired with Chuck Taylors, plaid pants and a bow-tie, I’m ready for a Gatsby party. (On the rare occasion when there isn’t such an event happening in San Francisco, one is happening in my head). This sweater came from eBay, and it’s a success story in the power of the saved search. I’m a big fan of Andre 3000s now defunct label, Benjamin Bixby (wherein he combined his middle and last name with vintage prep style). This sweater probably retailed for the cost of a semester at an ivy-league college, but I paid very little for it. On eBay, you can ask for an alert if a particular item is posted. 6 months ago, I saved a search for Andre 3000’s finest, received a notification a few weeks ago, and put in a low, low bid. 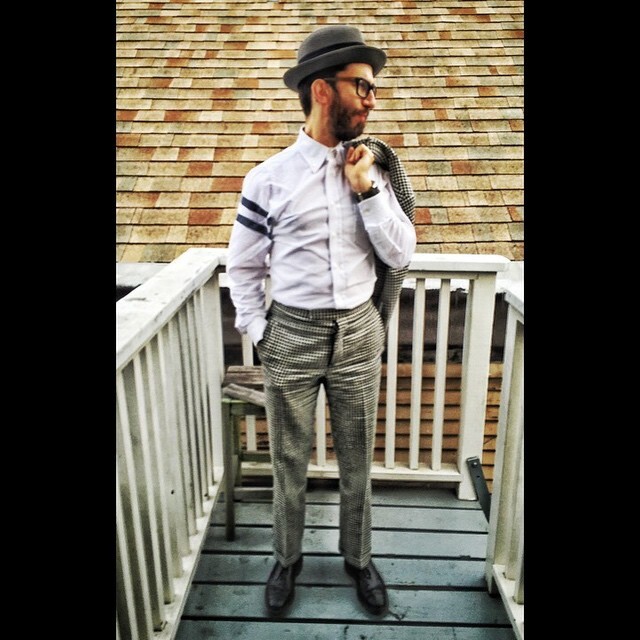 Here, I pair it with the ubiquitous dark denim, a used newsboy Goorin Brothers cap, and some PF Flyers, for an old school look. By the way, the whole outfit cost me under $80. Take that, Yale. I learned my economics on the internet. 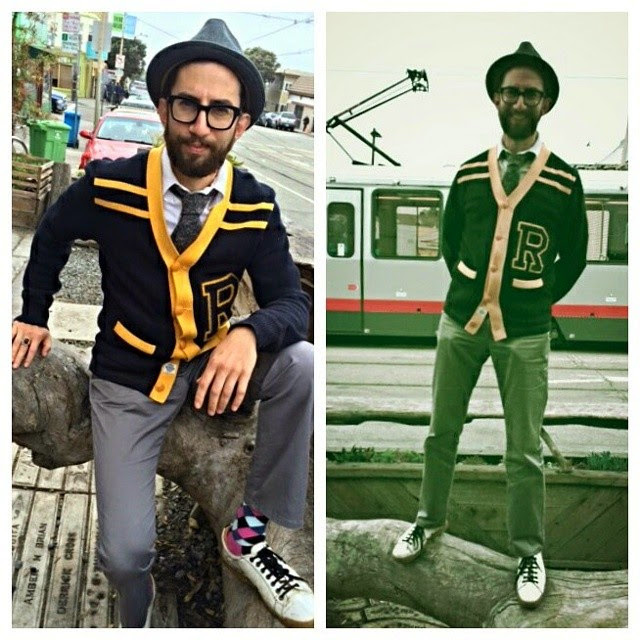 Here are two ways to pair vintage varsity with a suit. 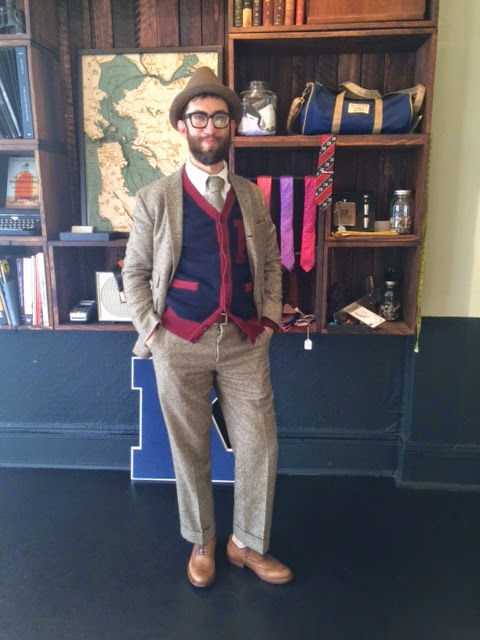 On the left, a vintage tweed suit pairs beautifully with the Kipper Clothiers cardigan. My advice: make sure the colors compliment each other, and avoid too smooth a suit; you want something with texture to balance the cozy sweater. On the right, the varsity look lives only in the sleeve of this dress shirt from Gant. I waited until this shirt was languishing on the clearance rack and got it for a third of the price. Incidentally, buttoning the top button (otherwise known as an “air tie“) helps to keep the look streamlined and casual – even while earning As for awesome. 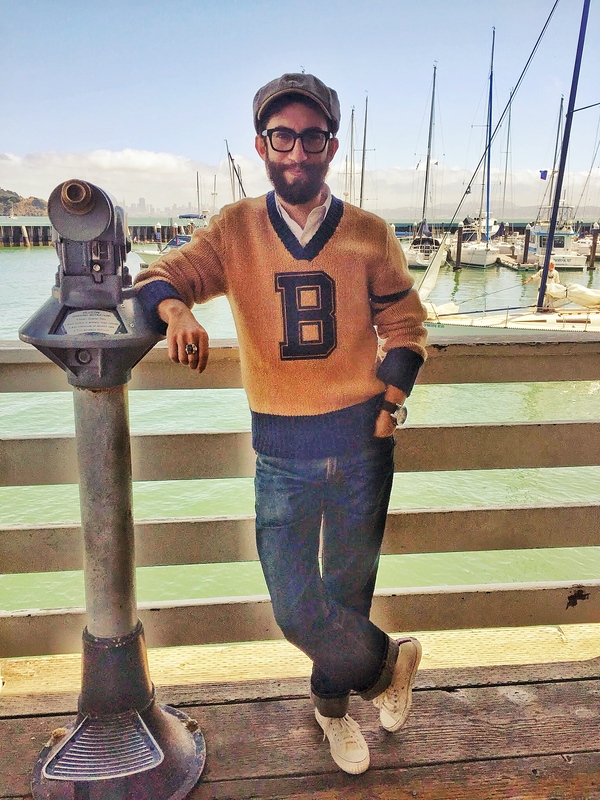 In case it wasn’t clear how much I love the vintage varsity look, maybe this will convince you, and maybe it will give you some ideas of your own: I poked around online and found a bunch of Rugby by Ralph Lauren cardigans for someone special. Gabi (said special person) wears a lot of great dresses, often with strong, primary colors. 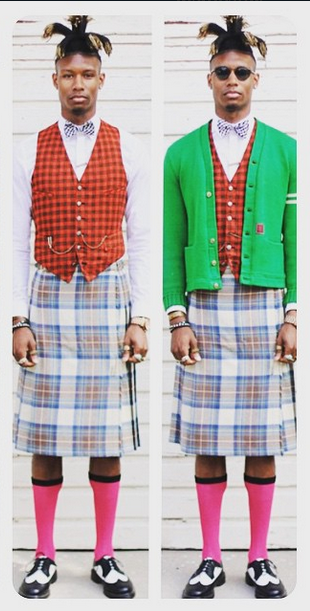 I wondered: how would those dresses pair with a vintage-style varsity sweater? Answer: amazing. The Rugby label is now defunct, but that doesn’t mean it isn’t available. Head over to your favorite online auction and offer a bid and see if you can’t bag a once-super-expensive sweater for much less. 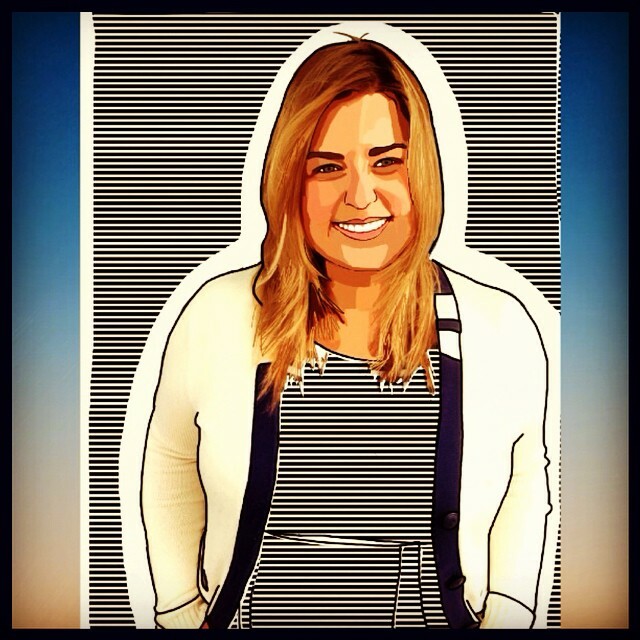 The sweater lends the outfit a cuddly, sporty aesthetic, and she pairs it beautifully with some Chuck Taylors, Clark’s Boots, or a pair of vintage heels. Sweater by Ralph Lauren Rugby, socks by Happy Socks, and hat by Goorin Brothers. Pair with a wool tie and a collared shirt and wear it anywhere. In an earlier post of Dress-Up/Dress-Down mashups, I got pretty nerdy on the subject of mixing formal and informal elements, creating great art, architecture, and style. Whether you decide to hunt for a varsity cardigan or not, I hope this post gives you some ideas for adding together sporty and dressy elements. GQ can keep their $400 “sportscore” designer sweatpants. I’d rather pull my influences from a style that never goes out of style.